Himlayan, Pantiyon, Kampo Santo, Sementeryo: Exploring Philippine Cemeteries contains five articles that looks into how different individuals are treated at death. The authors explore representations of non-adults, ethnicity, patriots, and boy scouts in various cemeteries in Manila and neighboring provinces during the different colonial periods in Philippine History. 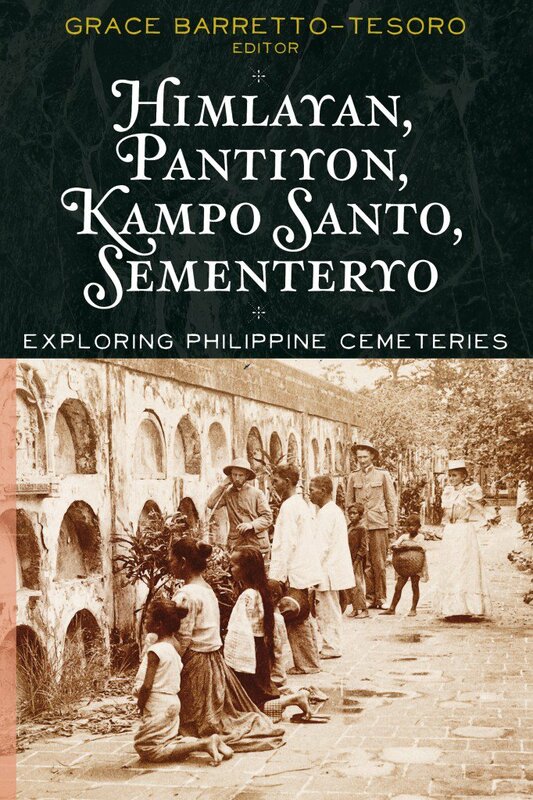 The book features infant and child burials in Manila North Cemetery and La Loma Catholic Cemetery; Chinese-Filipinos in the Manila Chinese Cemetery; the memorials and shrines built for Philippine Revolutionaries who fought against Spain and the United States; the Boy Scouts who died en route to the 11th World Scout Jamboree in Greece in 1963, and the military officers and soldiers, and national artists and scientists at the Libingan ng mga Bayani. The book advocates that we should take a second look at cemeteries not just as places for the dead but as active heritage sites where the living immortalize the dead through burial adornments. Mausoleums and gravestones also expose individual and collective histories of the deceased. The politics of where and how to bury the dead is a struggle. It is an internal emotional struggle of a mother who lost a child. It is a war of ideologies on defining who and what is a patriot. It is a clash between families and the government on owning the dead. And it is a conflict between a ruling class and the inferior merchant class divided by ethnicity and religion. The viability of cemeteries as heritage spaces is also examined in this book. Mausoleums exhibit architectural styles that rival other forms of built heritage. Burial structures are symbolic markers of the history of a people in a specific time and space. As such, Philippine cemeteries are reflections of our past. Donna Mae N. Arriola ([email protected]) obtained her MA in Archaeology at the University of the Philippines in Diliman. Her research interests include pottery during the Spanish Period. Grace Barretto-Tesoro ([email protected]) is an Associate Professor at the University of the Philippines-Archaeological Studies Program. Her research interests include pottery, gender, identity, status, and cosmology. She became interested in cemeteries when she participated in the excavation of the ruins of an old church in Sta. Teresita, Batangas, Philippines where they found remains of modern day fetuses in bottles. Omar K. Choa ([email protected]) earned a Diploma in Archaeology from the University of the Philippines-Archaeological Studies Program and recently completed the Erasmus Mundus International Master in Quaternary and Prehistory program in Europe. He is currently pursuing a doctorate in prehistory at the Musйum National d’Histoire Naturelle in Paris, France. His research interests center on the applications of the earth sciences to archaeology, particularly on the geochemical evolution of guano and its significance for the study of cave palaeoenvironments, geochronology, and taphonomy. Michelle S. Eusebio ([email protected]) is interested in raisingconsciousness on Philippine cultural heritage, focusing on historical cemeteries.She is also interested in Southeast Asia archaeology, ancient foodways, archaeological chemistry/biomolecular archaeology, making archaeology relevant to contemporary concerns in Southeast Asia, and integration of archaeological science and theory in research. She graduated with MS Archaeology degree from the Archaeological Studies Program of the University of the Philippines and a current PhD candidate majoring in Archaeology at the Department of Anthropology, University of Florida. She is continuing her work that started as her master’s research on organic residue analysis for her doctoral dissertation work, involving several Neolithic and/or Metal Age, precolonial, ethnographic, and experimental pottery in Southeast Asia. She is presently involved in groundbreaking projects in Southern Vietnam and Northern Philippines. Eleanor Marie S. Lim ([email protected]) is a graduate student at the University of the Philippines-Archaeological Studies Program specializing onhuman osteology and paleopathology. She finished her undergraduate degree in BS Medical Physics with specialization in Medical Instrumentation from the De La Salle University. Andrea Malaya M. Ragragio ([email protected]) is an Assistant Professor at the College of Humanities and Social Sciences in the University of the Philippines-Mindanao where she teaches anthropology and archaeology courses. She is the author of Archaeology and Emerging Kabikolan, also from the University of the Philippines Press. She is a member of the Alliance of Concerned Teachers. Kathleen D. C. Tantuico ([email protected]) obtained her Diploma in Archaeology from the University of the Philippines-Archaeological StudiesProgram in October 2011. She graduated with a Bachelor’s degree in Social Sciences, specializing in Cultural Heritage, minor in History from the Ateneo De Manila University in 2010. Currently, she is a student at the University of the Philippines College of Law.